"I wanted to try the full-blood Aussie Whites to see the comparison compared to the composites"
Ardene’s Bruce, Jannie, Ali and Roy Hodgson, Darlington, were happy with how their first on-property sale went last Thursday. THE first Victorian Australian White sale showed great promise, with Ardene Australian Whites' top-priced ram reaching an impressive $5000 last week. In sweltering heat at Darlington there was a good turn out of new and repeat clients. The top priced ram, lot 34, was purchased by Kym Staude, KD Sheep Studs, Bordertown, SA for $5000. "I've been trying Australian Whites for the last 18 months, over shedding composite ewes, with the early results looking good," Mr Staude said. "I wanted to try the full-blood Aussie Whites to see the comparison compared to the composites. "I was happy with the quality of stock that Ardene delivered on the day." Mr Staude also purchased five stud ewes at an average of $1500. The second and third top priced stud rams were purchased by Allan and Gaye Donovan, Allaya Australian Whites, Portland. The Donovan's paid $4250 for lot 35 and $3750 lot 39. Jim and Judy Stedman, Numurkah, bought eight foundation ewes and a stud ram for $3000. "We liked the quality of sheep that were here, and these are the type of sheep we want to start with," Mr Stedman said. 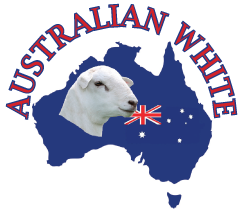 "We believe we have purchased a neat and uniform line of outstanding Aussie Whites." Ardene principal Bruce Hodgson said the sale was a great result, particularly as it was the stud's first ever open cry auction. "We wanted to get our name out there and to receive good interest," Mr Hodgson said. "It was good to see the amount of people considering entering into the breed as either a self replacing or terminal option." Elders auctioneer Jody Darcy, Casterton, said it was interesting to see the amount of onlookers considering the breed. "As far as purchases go, they selected very structurally correct rams that included people from South Australia, NSW and local interest," Ms Darcy said. "The Hodgson family should be commended on the top quality of sheep that are true to type, which are showing a lot of red meat, depth and bone."